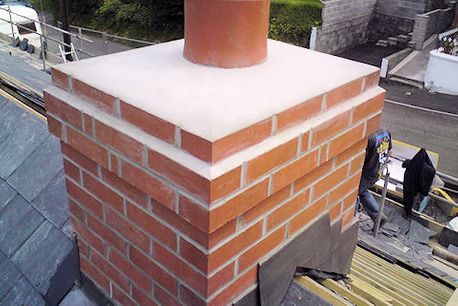 One of the most important aspects of any chimney build is to have a professionally made chimney relining. Chimney relining is installed on the inside of a chimney and is made to be resistant to the extreme heat created by an open fire or a stove. With so much experience in the field of chimney relining, Irish Chimney Specialists can offer one of the best chimney relining services in Ireland. Our extremely experienced team are fully equipped to add chimney relining to a newly built chimney or reline a chimney after a fire. Our team is available to reline chimneys with traditional clay or to with the more modern stainless steel chimney reliner. Do you need your chimney relined after a fire? Then get in contact with Irish Chimney Specialists today. In our 40 years inside the chimney industry, the biggest change we’ve seen is the introduction of stainless steel chimney liner. This durable material acts as a replacement for the traditional clay that has been used as a chimney liner for years. With so many Irish households now opting to replace their open fires with more energy and fuel efficient stoves, clay lining is known to crack under the extra heat produced by stoves. Clay lining is known to crack under the extra heat produced by stoves. Cracks in the lining of a chimney can lead to smoke escaping or moisture seeping into a property. Stainless steel chimney relining doesn’t have this problem as it is more suited to the extreme heat generated by stoves. Irish Chimney Specialists are available to update your clay chimney liner with the more effective stainless steel liner. Do you need your old clay chimney liner upgraded to stainless steel liner? Then get in contact with Irish Chimney Specialists today.